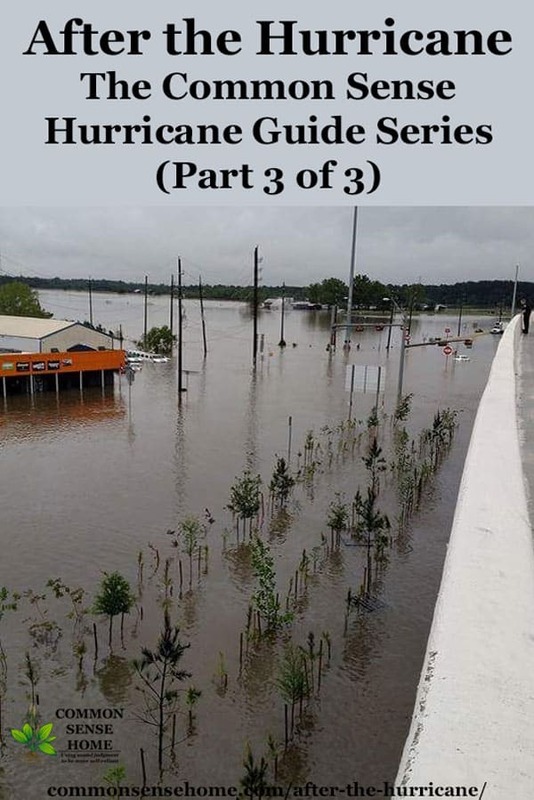 This post is #3 of 3 in The Common Sense Hurricane Guide Series. Please see “Before the Hurricane” and “During the Hurricane” for more information. 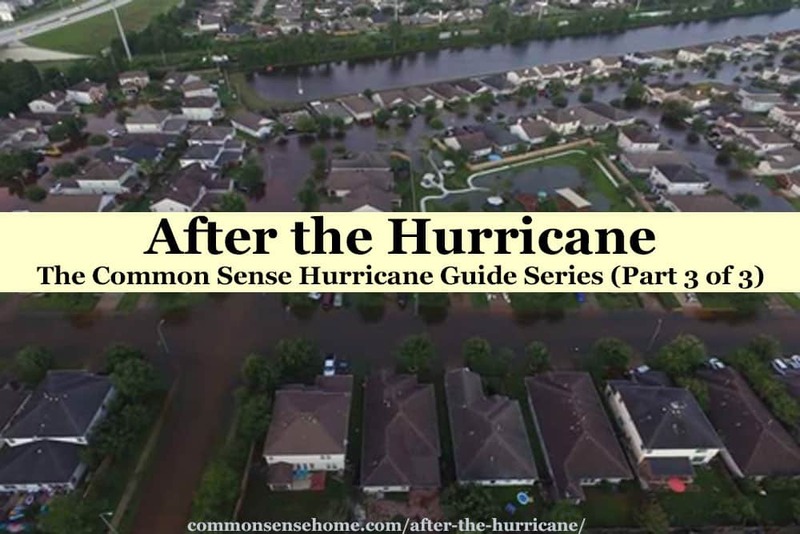 In this post, we'll talk about returning to your home after evacuation, safety concerns, and cleanup after the hurricane. Note: Once the hurricane has passed, you still need to be prepared to evacuate if flood waters are threatening. Even after the hurricane is over, flooding can get worse and force an evacuation. Rivers, bayous, reservoirs and lakes can overflow banks and crest quickly, even if the sky is clear. Ensure you can get back in. The area may still be quarantined, so you could try to return only to find you can't reach your home. This is where IDs and proof of residency are important. If possible, try to have someone else check out the area before returning. That way you don’t bring the entire family until you confirm it's safe. Inspect to make sure everything is safe. Even if the authorities are letting you back in, your home could have serious damage. Check doorways see if they are square, check if doors open and close. If waters have risen, unwanted visitors such as poisonous spiders, fire ants and snakes may be using your home for shelter. See “Natural Spider Repellents – 8 Ways to Get Rid of Spiders” for spider repellent tips. Below are some of the safety concerns you may face after the hurricane, depending on your location and the severity of the storm. A hurricane can result in pooling stagnant water. This can bring large numbers of mosquitoes that can carry disease. Use insect repellent as needed. Wear long sleeves, pants, and socks when you’re outside. See “How to Get Rid of Mosquitoes and Avoid Getting Bit” for more information. Even if you sheltered in place, be careful examining your home, garage and other buildings. Hurricanes may damage buildings and make them unsafe. Be cautious entering buildings after a hurricane, especially if it is obvious the building has been damaged. Make sure it’s safe before going inside, and mark unsafe buildings with a sign. Leave your home or other building immediately if you hear shifting or unusual noises. Strange noises could mean it’s about to fall. If the hurricane is still active, you will have to make the decision to evacuate or wait it out. After the hurricane, if you hear structural noises or can clearly see damage to the structure, evacuate. Stay out of flooded areas as much as possible. The only time you might go back into a flooded area is if you need to evacuate, because flood waters are rising (which can happen even after the hurricane is over as water flows from higher ground or overflows river banks). Limit your exposure to floodwater if you must evacuate. This includes your yard, the streets, etc. Don’t let the kids walk or play in it. Contaminants from raw sewage, floating trash cans/debris, insects, floating hives or fire ants, snakes, fertilizer/bug killer from neighboring yards can cause illnesses and serious even lethal bacterial infections. Also, a person walking or playing in water could fall into or be pulled into/sucked into a sewer or storm drain. Always follow warnings about flooded roads. NEVER drive through floodwater – it is probably deeper than you think. If you have to be in or near floodwater, wear a life jacket — especially if the water is rising or moving fast. Keep in mind that floodwater often carries germs. If you touch it, be sure to wash your hands with soap and water. If you don’t have soap or water, use alcohol-based wipes or sanitizer. Visit Flood Water After a Disaster or Emergency for more information. With or without flooding, after the hurricane goes through, many areas will be without power. Depending on the severity of the storm, it may be days or even weeks before power is restored. See “When the Power Grid Fails – 10 Things You Need to Prepare” for a power outage checklist. Assuming your cell phone works, check in with your out of state Point of Contact – let them know the hurricane is over, but the power is NOT back on. You can use your point of contact to request assistance from 911, authorities, the Cajun Navy or other volunteers. If you have materials for a sign, make one to mark the home stable or unstable if you are in a badly affected area. If you don’t have the materials for a sign, hang a white towel, shirt, etc.… outside letting people know someone is there. A sign with the number of people is even better. Indicate a need for assistance due to injuries with a red flag and/or a sign. Alternately you can fly a US Flag upside down. That indicates duress (big problems/risk) – a flag flown right side up means all okay. Keep food in coolers. Open the freezer and refrigerator as little as possible. All food that was exposed to flood water (even if it’s in a can or bottle) should be thrown out. As you need frozen foods, move them in bulk quickly to coolers so you open and close the cooler instead of the freezer. If you don't have a generator to keep the freeze cold in an extended power outage, find a way to cook the food and eat it so it doesn’t go to waste. You can grill outside without electricity, using propane grill or charcoal grill. Don’t cook with open flame indoors. Continue to use canned or dry goods for snacks/treats. You can cook or warm things one at a time, cook meat then warm up canned food / veggies in a pan over a charcoal or propane grill. See “Emergency Cooking – 10 Ways to Have a Hot Meal When the Power Goes Out” for more cooking ideas. Filter all tap water before using it – and boil where possible. Remember to keep drinking a LOT of water, it is easy to get dehydrated in humid/hot conditions. No power means no A/C. Move pets into one location (closest to your emergency exit) with their crates so you can quickly put them in the crates in an emergency. Also if you can let them out keep them leashed, they will likely want to enter floodwaters, or drink floodwaters. You want to keep pets away from floodwaters. Take turns staying awake, so someone is keeping an eye on the storm, water levels and listening to the radio/internet. Turn the Weather radio on and listen to your weather radio for updates, and keep track of damage areas, flooding areas and official updates. Keep away from down power lines and report them if possible. 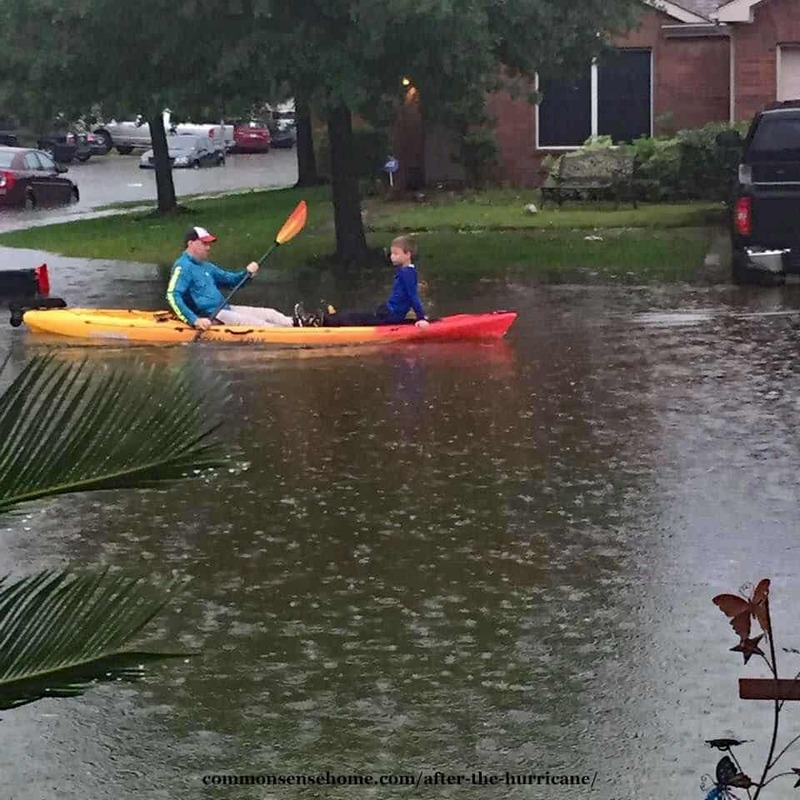 Even after the storm, flooding will usually get worse before it gets better. This is especially true if you are near dams, lakes or reservoirs. Open your garage door by pulling the lever and lifting the door manually, may require 2+ people. Grab the notepad and take notes of key details. Take pictures and video of the exterior, and pictures as you work identifying what you are doing. Evaluate your situation and start taking out damaged/flooded debris, furniture, personal items, etc… once the water has receded and it is safe to do so. 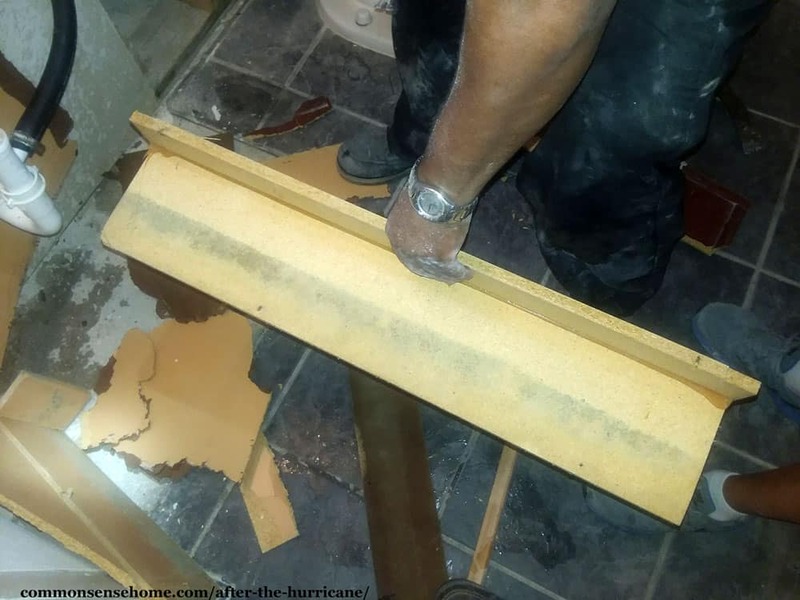 As we noted in Before the Hurricane, take pictures and video of each room Before, During the hurricane, and After the hurricane – during cleanup and after the cleanup. Show pictures of people doing demo and cleanup. You have checked the house and yard. The power and water are still out, and flooding may be nearby. Get your generator running. Power gives you options. Focus on getting your freezer and/or refrigerator running for safe food storage. See “Emergency Power Options for Your Home” for more information on generators. Remember to keep smartphones in airplane mode or powered off. Charge your phone with a solar panel or crank charger. Use a solar USB charger to charge smartphones, AA, AAA and 18650 batteries as needed. If your car / truck works, you can charge your cellphones when the vehicle is running, so think ahead to charge things when you travel. Make sure you keep your smartphones charged and regularly check in with your Point of Contact. Even if the hurricane is over, the floodwaters can rise and force you out of your home. If you are in a potential flood zone, please keep watch on the situation and evacuate if needed. Check freezers and refrigerators for spoiled food. When in doubt, throw it out. Again, all food that was exposed to flood water (even if it’s in a can or bottle) should be thrown out. Don’t drink tap water or prepare food with tap water until you are sure it’s not contaminated. (Boil or filter everything until you are absolutely SURE it’s safe). Most of this “after the hurricane” section focuses on cleanup after flooding, since that tends to be some of the toughest damage to clear. Some parts apply to general hurricane damage. Skim through and apply what you find useful for your situation. If there's been flooding, have a professional check your electrical system. Call your electrician and AC guy (may be one in neighborhood too) and see if they are available to come out and check outlets and AC unit. Only turn your AC back on once it’s safe. The sooner you can get AC on, the better. Heat and humidity are your enemy if your home has been flooded. Set AC to at most 73°F and replace filters regularly. Replace filters every 3 days at most days until walls are up and textured, and then at least once a week until air is clear and floors are installed. This is where those tables and shelves will start coming in handy. If there was flooding check for mold, and remove all wet items as soon as possible. Store them in a garage or outside if they are covered (protected from further weather damage). You can also prioritize the keep/clean piles so you get the stuff you need sooner done first. Get started with cleanup quickly. 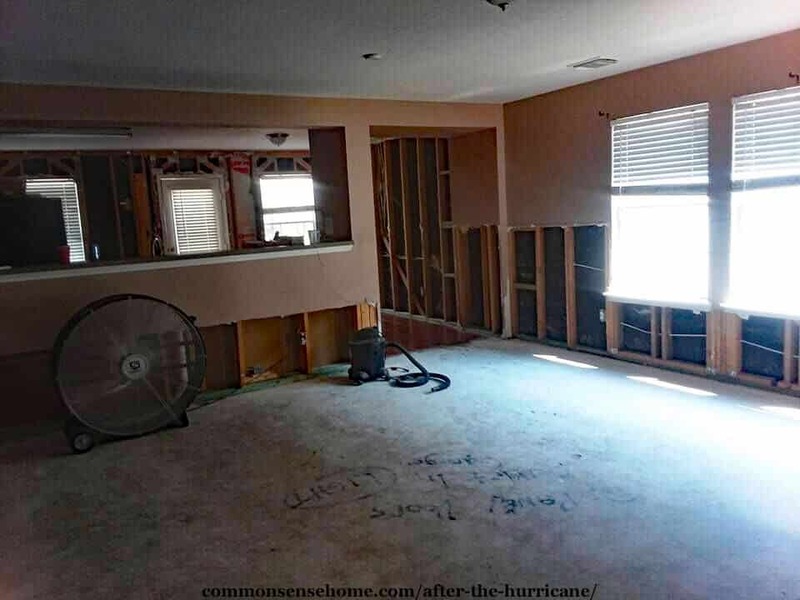 Don’t wait on FEMA or your insurance to remove sheetrock, cabinets, insulation, or carpet! The longer the damage and/or mold remains in your home, the worse it will get. Just take lots of pictures and video and upload daily and upload your spreadsheet with your itemized list of household items lost ASAP. You will get conflicting answers when you call for assistance. Have patience and know it’s a long process. Video record and take pictures of the aftermath and as you are in the cleanup process for insurance. Take Pictures of ALL damage and Video if possible. Continue to take pictures and video throughout the process. The more pictures the better and start uploading IMMEDIATELY to FEMA and Insurance companies. This will drastically increase your payment time and shorten the time to get back to normal. Clearly mark garbage – double bag it. Evaluate your situation and start taking out damaged/flooded debris, furniture, personal items, etc. once the water has receded and it is safe to do so. Take pictures of each room, Before, During and after removal. Show pictures of people doing demo. Sort your garbage into piles, as close to street as possible. 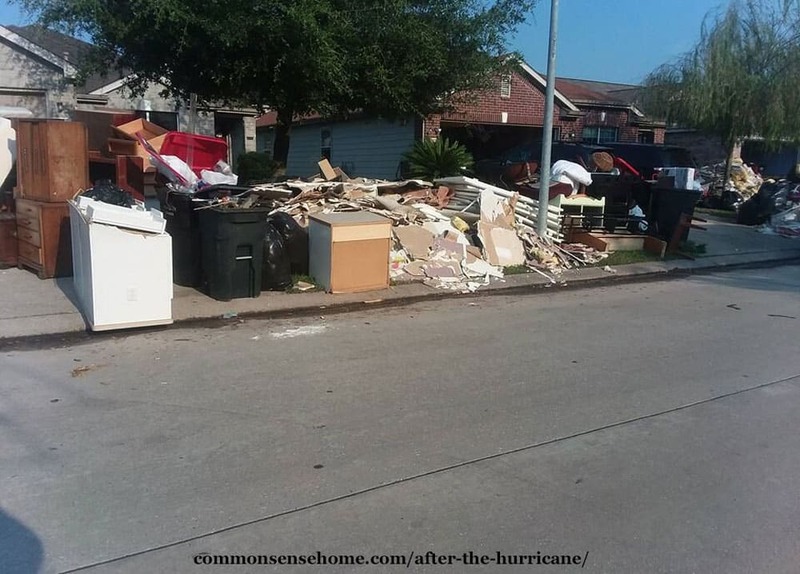 Many cities require you to separate household furniture from demo debris (as many are toxic). Clean up will go faster if you do so from the start. Bag insulation and take out bagged separated. Pile sheetrock, baseboards, laminate, tile and carpet materials together. Small debris from all should be bagged and put in like piles when possible. Your yard will thank you later. Once you have power, set up box fans to dry things. Once things are clean and dry, turn on an air filter/purifier and change the filters regularly. If you have ceiling fans, turn them on also. Extra airflow can make air temp feel 5 to 15 degrees cooler. Wear protective face masks as much as possible while cleaning your home. Breathing in the sheetrock dust, bacteria and mold spores is not safe, and causes many to have severe breathing issues. If you have mold, hold off on using fans until mold is cleaned up to avoid spreading the spores. Unscrew and sanitize outlet covers, switch covers and door knobs. Once packed up in crates and store in garage. Use ziploc bags to put outlet covers and their screws in bags and label per room. Store in plastic crates with power switch outlets, screws, vents and their screws etc. Remove hardware from doors if keeping door knob hardware and label per room. Place in separate crate. If you had moderate to major flooding, you may not want to keep all the small items. Our Texas family ended up having to buy new items even though they kept all the old covers, door knobs and such because they the electrician put it all in after the new sheetrock and new plugs had to be installed because of the flooding. Some tried to keep door knobs, but that can be a trick with a totally new door if the door handle-hole alignment is different. Wrap your mattresses, furniture and any clothes you aren’t using if they survived or at least tape trash bags together and cover to keep dust and demo debris off them. If a room was not damaged, you can seal it by putting up plastic sheeting. If you don’t have sheets of plastic, you can and cut open trash bags and duct tape/packing tape/painters tape to make makeshift walls and doors for privacy and to protect your items placed in less used rooms while construction is going on. Sore what you can out of the way in the garage. If it doesn't all fit, put shelving, crates, boxes and/or plastic shelving carts in middle of room once demo is done and wrap and tape tightly with plastic. If you can saran wrap the boxes do so. You will thank me later. This will reduce the amount of items you have to clean once you can unpack from massive amounts of sheetrock dust, drywall mud, dust, etc. If flooding has occurred, use a moisture meter in walls and studs to see how far up the water went in your home. Mark with a sharpie, pen, exacto knife, etc… (Test in numerous areas; doors/windows and walls at least every 14 inches (each stud should be 14 inches apart). Clear rooms before you start removing drywall. Cut as straight of lines as you can in removing drywall. Set up work stations for cleaning and storing everything that you are keeping. Remove all the nails, staples, carpet nail beds and screws as you go in walls and on floors. Begin removing baseboards with a utility knife and crowbar. Be prepared, water can come gushing out of the wall when you remove the drywall, especially if your house wasn't sealed properly from the outside or a lot of water got into your home during the following. Cut caulking along the top of the baseboard before using crowbar for quicker, safer removal and to keep from ripping holes and damaging power outlets. Remove sheetrock and insulation at least 2 feet above highest water-line; in as straight a line as you can cut. Using a drywall-T as a guide can help make clean straight cuts. Make sure to use masks, gloves and long sleeve shirts during this process. Set up plastic bin carts and use as “dressers”, safe, clean toys, kitchen stuff etc… Can stack 2 to 3 high. Keep paper plates, cups, bowls and silverware in a cooler or your fridge to keep sanitized. Keep shoes in their original boxes, bins, and/or put in double grocery bags to keep dust out. You can purchase blow up mattresses to sleep on during the construction, especially if you are unsure if the mattresses were exposed to flood water. Use baskets, or cleaning bucket for toiletries. No power, likely means no water which means no flush toilet. Be prepared with extra toilet paper. You can use lysol wipes to sterilize your hands after going to the bathroom to ensure you are clean, and not spreading e-coli. Once paint is on walls clean or replace the bathroom and laundry room vents which will be covered in sheetrock and sawdust dust. Do this every day or at least every few days. Let dust settle overnight then soak an old towel and walk through house cleaning floors with it. Sweep and use towels to cut down on sheetrock and concrete dust and to help manage mold. You will need to pass a mold test if you’ve had a lot of moisture in your home. The longer you wait, the more mold growth you are likely to have, so early detection is important. Get your home professionally tested for mold and keep the report. You'll need it if you ever want to sell the home. They will come out and evaluate and tell you if they think you would pass or not and what you can do to get the levels down. They “swab the air” with a little machine on a tripod and you usually get results within 48 hours. Home mold test kits are not reliable. If mold is on the surface of metal, hard words, ceramic or other smooth surfaces, you can clean it of with bleach, vinegar or baking soda/water mixture. Baking soda solution is a natural, mild disinfectant and will clean mold off solid surfaces without leaving behind a scent. If you have mold in walls or in porous items like particle board, drywall, door frames, rugs, or cloth, then bleach/vinegar/baking soda will clean the surface but not kill all the mold inside the item. If you look carefully, you can see the line of bluish grey mold on this piece of pressboard cabinet. This cannot be cleaned and needs to be removed. If you fail your mold test, have mold killed by a professional. Services to consider include: ServicePro and ServiceMaster, they are expensive but thorough. Consider Orkin and other pest control as well. They have mold remediation and are 1/4th the cost of ServicePro and ServiceMaster. Once the professionals finish, have the mold testing company come back out (will often do this at no further cost to you) and retest to ensure you pass inspection. Do this as soon as possible. Every day the mold can triple in your air and on your surfaces. If flood-water got into your home, have your fireplace inspected to insure there aren’t any problems. This is also a hotbed for mold growth because it is hard to get to and around. Remove door frames and doors as soon as possible around doors are one of the worst places for mold and mildew to thrive. MDF and particle board doors, cabinets, baseboards, furniture, frames cannot be saved. They soak up water/sewage etc. like a sponge and are perfect breeding ground for mold and mildew. If you have mold, fans make it worse because it blows the mold spores around to lay on new surfaces and grow, creating a snowball effect (don’t use fans until the mold is cleaned up). If in doubt, throw it out. Risking your family’s health isn’t worth it. Check in with your social media for people who are volunteering to help with demo, cleaning, food, supplies etc. The faster you can get the demo done the better off your home will be and the shorter your recovery process. Wash bedding often, especially if you are living in the reconstruct. Contact your alarm, cableTV, phone, power, water or other utility companies and let them know your status and schedule them to come back out to turn on and/or repair the various services. You can expect minor injuries. Cuts can and will happen often as you clean up; such as removing sheetrock, baseboards etc. You are likely to get scratched from exposed nails. Have lots of sanitizing options (rubbing alcohol etc.) on hand and Band-Aids (preferably waterproof). Clean wounds and protect them. WEAR GLOVES, eye protection and a mask if you have them. Stay Safe Working Outside. Stay clear of fallen power lines. Call the electric company to report them. Watch out for power lines overhead. Learn more on how to protect yourself from electrical hazards after a disaster. Watch for debris, fallen tree limbs, and trash that may have washed into your yard. Stay away from wild, stray or dead animals after the hurricane. Call 911 or your public health department to report them. Learn more on how to protect yourself from animals or pests after a disaster. Bigger injuries. If anyone is injured remain calm, grab your first aid kit, control bleeding if needed and make the person as comfortable as possible. Control for shock if the injury is severe. Keep injured people hydrated (unless you suspect internal injury). Contact authorities for professional assistance if needed (you might need to use SMS/texting or Facebook texting to get the message out). Be prepared to wait, it could be hours or even a day before help arrives. This is why we suggest the first aid kit and getting first aid training. Thank you for doing these posts. I hope it helps a lot of people. A lot of hurricane guides tell you what to do before but not step by baby step what to do after. Thank you for all your help, Amanda.